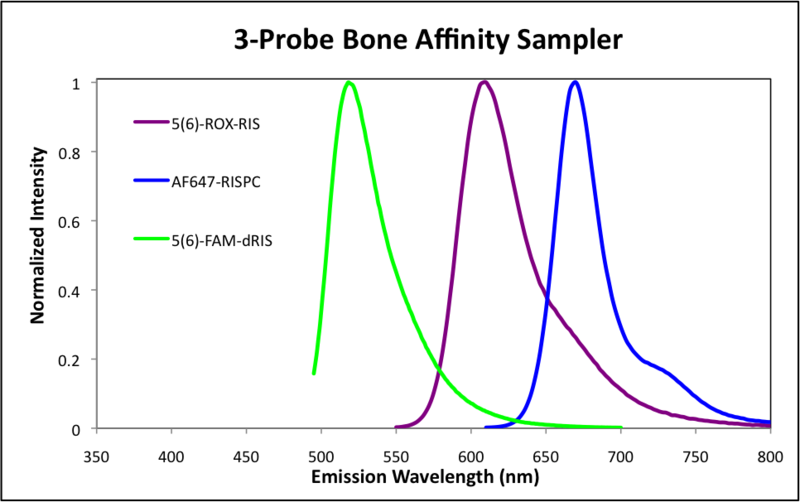 This sampler kit includes three imaging probes with different spectroscopic properties and high, medium and low bone affinities (in the order of 5(6)-ROX-RIS > 5(6)-FAM-dRIS > AF647-RISPC). All three probes include bisphosphonate or phosphonocarboxylate molecular skeleton, thus have higher affinity than calcein (the fluorescent molecule with the least bone affinity). The kit can be used for simultaneous detection with co-dosing and studies on effects of bone affinity. Emission spectra of 5(6)-ROX-RIS (in 0.1 M phosphate buffer, pH 8.0), 5(6)-FAM-dRIS (in 0.1 M phosphate buffer, pH 7.2) and AF647-RISPC (in 0.1 M phosphate buffer, pH 7.0).